The first book in Amy Clipston's beloved Amish Heirloom series-and an ECPA bestseller! After losing her fiancé in a tragic accident, Veronica Fisher finds solace in the old recipes stored in her mother's hope chest-and in a special visitor who comes to her bake stand to purchase her old-fashioned raspberry pies. Veronica Fisher knows how lucky she is to be marrying her best friend. Seth Lapp is kind, hardworking, and handsome-but most importantly, he loves Veronica. When an accident on the job steals Seth away from her, a heartbroken Veronica is certain she will never love-or be loved-again. Yet when she discovers a batch of forgotten recipes and opens a bake stand to sell her Mammi's raspberry pies, Veronica picks up a regular customer who gives her heart pause. Jason Huyard was with Seth when he lost his life-a memory that haunts him still. So when he seeks out the grieving fiancée to convey his condolences, the last thing he expects-or wants-is to fall in love. Nonetheless, Jason soon finds himself visiting Veronica's bake stand every week ... and it's for more than the raspberry pies. Now, as Veronica's heart thaws, Jason can't bring himself to tell her he was there when Seth died. Can he ever reveal where he was on the day her life derailed? Or will his secret rob them of the second chance at love they both want? "Clipston delivers another enchanting series starter with a tasty premise, family secrets, and sweet-as-pie romance, offering assurance that true love can happen more than once and second chances are worth fighting for." -RT Book Reviews, 4½ stars, TOP PICK! 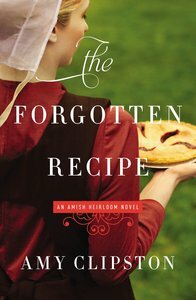 About "The Forgotten Recipe (#01 in Amish Heirloom Novel Series)"
Amy Clipston is a first-time author and member of American Christian Fiction Writers (ACFW). She holds a degree in communications from Virginia Wesleyan College and works full-time as a public information specialist for the City of Charlotte, NC. Amy lives in North Carolina with her husband and two sons. Pre-Order now to secure your copy. Expected to ship March 2020. Pre-Order now to secure your copy. Expected to ship February 2020.